First up I have this "sweet link" for you. The Sweet Book of Candy Making: From the Simple to the Spectacular-How to Make Caramels, Fudge, Hard Candy, Fondant, Toffee, and More!. Quarry Spoon for a recipe for Mom's Old Fashion Soft Caramels. Crochet socks are not that easy to make, but the Crafty Princess is tackling them anyway. Eileen shares the how-to for a sand and sea themed glass-beaded bracelet. Have you tried Derwent's Inktense pencils? They're like nothing you've ever used before! Cherie makes some glass mushrooms for the garden using recycled materials. Jack Daniels does letterpress video. 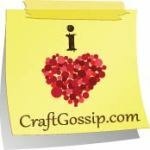 Craftastic links at Craftside - plus, Qbookshop's having a Back to School Sale! I hope you all had a great weekend and have some good creativity on your agenda for the week! Did you happen to try any of the six free projects that were featured in last Friday's post? And in honor of the it being "back to school season," Qbookshop.com is having a (what else) Back to School Sale! You'll find one of the world's largest collections of craft books at Qbookshop.com. There's still plenty of summer left to finish that mixed-media or needlework project you've been putting off, and they've got the books to help you get started. The Qbookshop.com craft library has your crafting needs covered, whether your passion is needlework, scrapbooking, sewing, beadwork or another hobby. Here's the best news: for a limited time you can save 30% off the original price on your entire purchase of books about any hobby. After you place your items in the shopping cart, just enter Promo Code SUMMER6 and click the "Apply" button before checking out. Don't delay! This offer ends at midnight CT on Monday, August 27. June takes a bird from a journal page to one nesting in a tree..and shares the pattern for you to make your own! Will you play along with the current craft challenge? Create a pencil holder or two, decorate your pens and pencils, and then submit your projects! It's back to school season, and Aileen offers you a set of freebie bookmarks for you to save, print and color. Carmi has redeemed her pincushion-making reputation with a new design! Needle-felting is an amazing low-tech hobby, and Tammy gives you a review of a new needle-felting book Felted Feathered Friends. Eileen shares an August-themed envelope for her hubby's birthday, along with how to make custom envelopes the easy way and the hard way. Cherie makes a green glass sculpture with some pieces she has on hand. Cyndi decided to make a test piece out of felt before committing some of her hand-painted fabrics to the project. And it turns out that she likes the test piece pretty much the way it is! Carmi has a brief post showing you how she dries flower for her resin pouring projects. Congrats go out to Anita B. of the blog Anita's Craft Corner. She is the proud new owner of a bunch of the new Sizzix dies and a copy of Water Paper Paint: Exploring Creativity with Watercolor and Mixed Media. And our Craftside prize package of a bunch of Sizzix dies and a copy of 1,000 Artists' Books: Exploring the Book as Art was won by Candace J. of Cool2Craft. A modern quilt guild shows how they pulled off an inexpensive and festive outdoor quilt show. Visit Lindsay's blog for some beautiful community quilting inspiration. Cyndi shares her favorite method for giving a photo a sepia look...and then printing it out on fabric! This week Carmi shares her cursed hexagon sewing project. Pinterest is a visual playground for crafters and DIY lovers, but there's always something new to learn. Check out these top Pinterest Tips for craft bloggers and handmade business owners! From rummaging tools to craft store discounts, these Top 10 iPhone and iPad craft apps offer something unique to help fuel your crafting fire. Tammy won another podcast contest and gives you the scoop on how these contests work and where to look for them. Eileen missed the blog hop this year but went ahead and made blue jeans themed bracelets for the 7k Bracelets of Hope Campaign anyway. Note to self: watch for blog hop notice in January next year! Cherie makes glass sculptures with lights for the garden. To kick off the week, I have a fun photo of a big group of quilters and their copies of the book Quilts in the Attic: Uncovering the Hidden Stories of the Quilts We Love, taken at a recent book signing with author Karen Musgrave. As both history and art, quilts help express the human experience and can lead quilters to discoveries about themselves, about the past, and about artistic creation as a whole. This book features 30 heartwarming stories of great quilt discoveries—from bidding on a breathtaking quilt at an estate auction in Virginia to uncovering a little-known art form in France to finding and repairing a priceless heirloom quilt that had been used, neglected, and damaged, these stories from everyday stitchers and well-known quilters alike reveal the mystery and meaning of the quilts we love. Karen Musgrave is a quiltmaker, mask maker, teacher, speaker, writer, and curator. For more than ten years, she has been forging a connection between American quiltmaking and other cultures. Her work has been exhibited internationally and is in many private collections. She lives in Naperville, Illinois. Aileen shows you how to create a unique journal from a Trader Joe flyer. Cherie creates a glass garden sculpture with solar lights. The princess takes a look at Peter Pan—that is, Peter Pan yarns. The Artful Crafter is having a card party! All are welcome. Link up and share your creations at Card Party Central. Cyndi gets to visit the famous Kimura Fabrics...on the big island of Hawai'i! Learn how to transform a plain tank top for 4th of July with Simply Spray fabric paint. We were so pleased to do a big giveaway with DMC Threads, and I want to thank them for participating. Congrats go out to Maeri F. of Freeport, IL, the DMC blog winner, and Kristy S. of the blog Hopeful Threads, our Craftside prize package winner! Next, if you are a cross-stitcher, check out this post over at the DMC blog that features a pattern of the iconic poster "Keep Calm and Carry On." Fashion Filter: Novelty Trends: Purse or Pet? Learn how to make a 4th of July decoupaged wreath! The Crafty Princess takes a look at spinning, which is super hot right now in the fiber world.